Karen Lin wanted to illustrate the anguish and doubt experienced by the parents of a missing child. The talented 10-year-old artist from John Bowne Elementary in Queens created a poster depicting a father clutching his face in sorrow. He’s flanked by photographs showing the silhouettes of his family – once-happy memories now shrouded in questions and uncertainty since his child went missing. Karen’s poster has been selected from a pool of 100 entries to represent New York in the National Missing Children’s Day Poster Contest, a competition for fifth-graders sponsored annually by the U.S. Department of Justice. New York and other states annually coordinate their own contests, the winners of which compete against each other in the national competition. 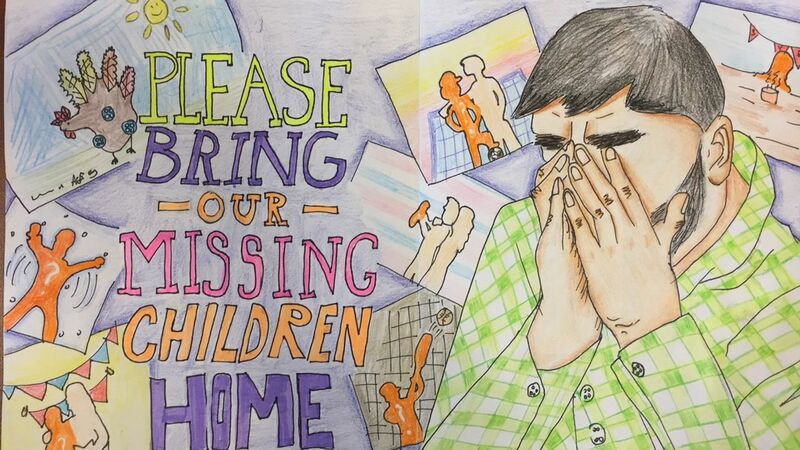 Karen Lin’s first place poster, which represented New York State in the National Missing Children’s Day Poster Contest sponsored by the U.S. Department of Justice. 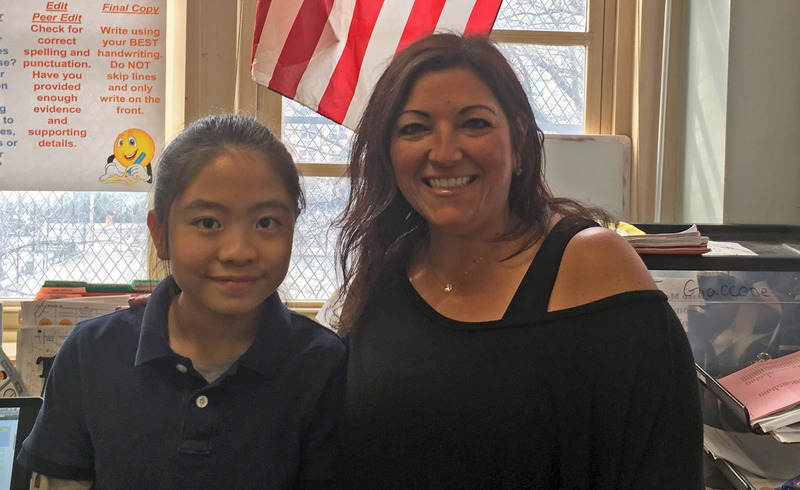 Poster contest winner Karen Lin and her fifth-grade teacher, Amy Schlossberg. From left to right: Contest judges Michael C. Green, executive deputy commissioner of DCJS; Megan Craft, a detective with the Albany Police Department; and Matt Frear, whose teenage brother Craig disappeared from Schenectady County in 2004. Green displays the winning poster while Craft shows the second-place winner and Frear, the third-place winner. 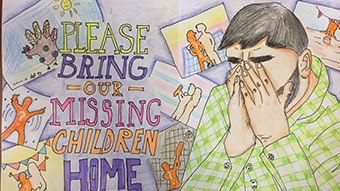 The winner of the national competition will be announced next month in Washington, D.C. and the top student poster will be used to promote this year’s National Missing Children’s Day, which is marked annually on May 25. “We all need to know that we’ll never forget our loved ones,” Karen wrote in a description of her poster. It was unanimously selected as New York’s winner by a panel of three judges, which assessed the posters without knowing the students’ names or what school they attend. The state and national competitions are designed to raise awareness and educate the public about unresolved missing children cases. 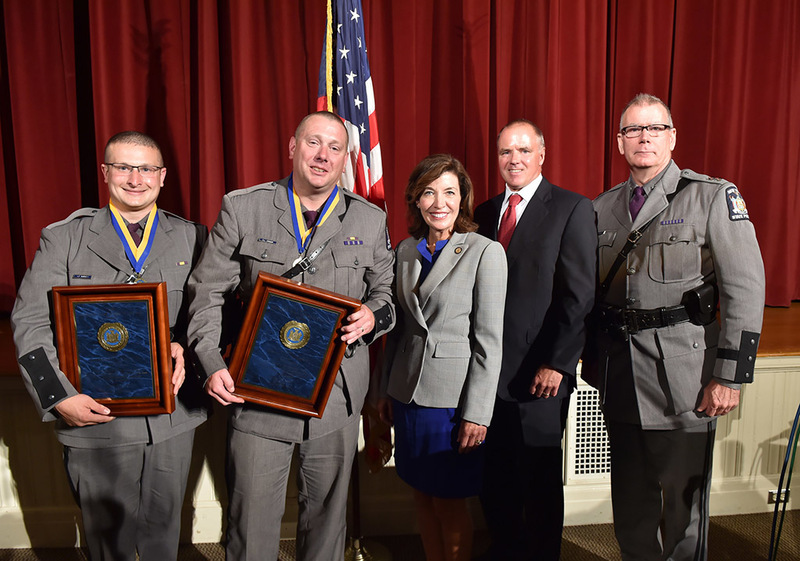 The New York State Missing Persons Clearinghouse, which is located at the state Division of Criminal Justice Services (DCJS), sponsored the state’s contest. Judging the entries were DCJS Executive Deputy Commissioner Michael C. Green; Megan Craft, a detective with the Albany Police Department who specializes in missing children cases; and Matt Frear, whose teenage brother Craig disappeared from Schenectady County in 2004. May 25 was designated National Missing Children’s Day in 1983. On that date four years earlier, 6-year-old Etan Patz vanished in New York City. The boy’s disappearance gained wide publicity and created a groundswell of attention to the plight of missing children. Just last month – nearly four decades after Etan went missing – a Manhattan jury convicted a man in connection with his kidnapping and murder. 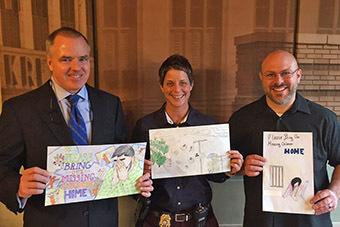 Karen’s winning entry and all other poster submitted to the New York contest will be on display at the Empire State Plaza Concourse in Albany during the week of May 22, to coincide with Missing Children’s Day. In addition to first place, New York’s contest featured second- and third-place winners: Alfred Krasniqi from Public School 30 in Yonkers secured the number two slot and Melody Jiang from PS 877 51st Ave Academy in Elmhurst, number three. There were 18,417 children reported missing across New York State in 2016. Many of these reports were resolved and the median time for a case resolution was seven days last year. Still, 2,401 missing children cases remain unresolved from last year and prior years.